The Washington State Patrol is asking anyone who witnessed a rollover crash on Interstate 5 Thursday morning to come forward. The incident happened near Seneca Street in the southbound express lanes of I-5 shortly before 4:50 a.m.
A dark-colored 2001 Chrysler Town and Country van was headed south on I-5 near the Convention Center. The van changed lanes and struck the rear end of a semi-trailer that was also heading southbound. The semi-truck did not stop. The van struck a barrier on the highway and rolled onto its side. The driver of the van suffered a broken arm and possibly other injuries. 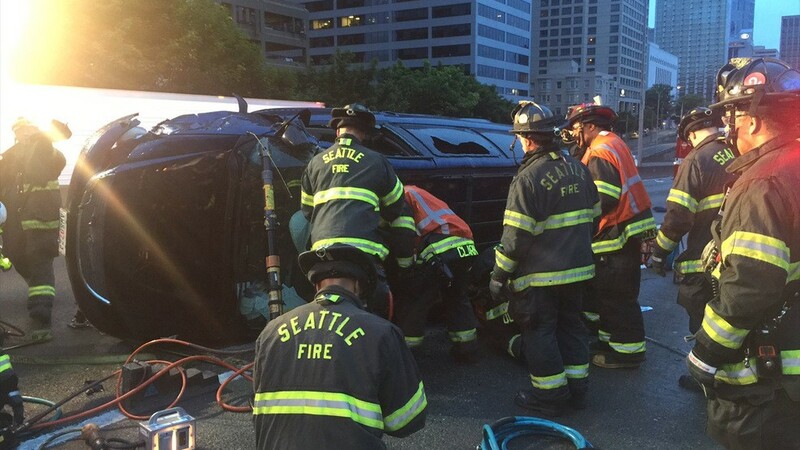 He was extricated from his vehicle by the Seattle Fire Department transported to Harborview Medical Center in Seattle. In a press release, Trooper Rick Johnson with the Washington State Patrol asked witnesses to call the tip line at (425) 401-7741 if they have any identifying information about the semi-truck. It’s very common for semi-trucks involved in serious collisions to leave the scene of an accident. This happens frequently when a truck is rear-ended, when it clips a smaller vehicle or a pedestrian, or when someone else on the road is injured by a truck’s lost load or blown tire. In some cases, a semi-truck driver may not even realize that they’ve caused a life-threatening accident. Fully loaded semi-trucks are massive vehicles. They can weigh up to 80,000 pounds, and the driver’s position in the raised cab at the front leaves them with major blind spots to the front, sides, and rear of the vehicle. It’s often the case that a semi-truck driver doesn’t hear or feel an impact, even if it’s a serious one. These drivers leave the scene of the accident because they don’t even know that there was an accident. While police try to track these drivers down, they’re rarely charged with felony hit-and-run if they can convince officers that they genuinely weren’t aware of a crash. In other cases, a trucker may leave the scene on purpose because they don’t want to be involved in an accident investigation. Studies have show that semi-truck drivers are at high risk of driving under the influence of drugs. Drivers are also frequently tempted to falsify their logbooks instead of following federal regulations about rest periods. After an accident, these logbooks are scrutinized by lawyers and law enforcement officials, so a drowsy driver may leave the scene to try to avoid an investigation. In some cases, a driver may just want to avoid the hassle of dealing with an accident investigation, or might know that they will lose their job if they have an accident on their record. If you’ve been injured in a collision involving a semi-truck or other large commercial vehicle, it’s a good idea to speak with an experienced semi-truck accident attorney as soon as possible. If you have any questions about how to file an insurance claim after a semi-truck accident, you can get in touch with our legal team at any time by calling (206) 727-4000, using our online chat feature, or visiting our contact page.